Join us for eat, dance, play @ Çatalhöyük, a project led by Professor Ruth Tringham of UC Berkeley that explores the intricate life practices of a Neolithic village in Turkey. 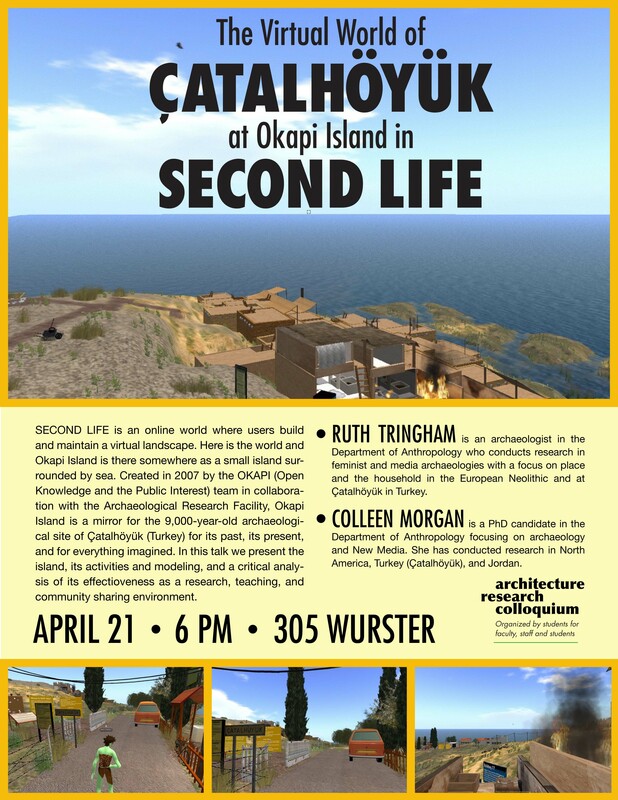 Okapi Island, which has been in development since 2006, offers individuals the unique opportunity to explore reconstructions of Çatalhöyük, visit our virtual museum, and take guided video walks through the Island. In this demonstration you will join in authentic cooking lessons, dancing by the firelight, and canoeing down the river of Çatalhöyük. We will present student work and changes we made to the island over the past semester. Don’t miss the chance to explore the unique multimedia exhibits of Çatalhöyük research data and come connect with us on Okapi Island. Introduction to Okapi Island by Ruth Tringham (Professor of Anthropology, UC Berkeley, and Principal Investigator of Berkeley Archaeologists at Çatalhöyük). Join Ruth as she explains the background of the project, current projects, and future goals. Tell Tour/introduction to the changes on the Island by Colleen Morgan, including a brief presentation about her 2009 Archaeologies publication. Student demonstrations of their work this semester, including cooking lessons and an lecture about archiving cultural heritage in Second Life. 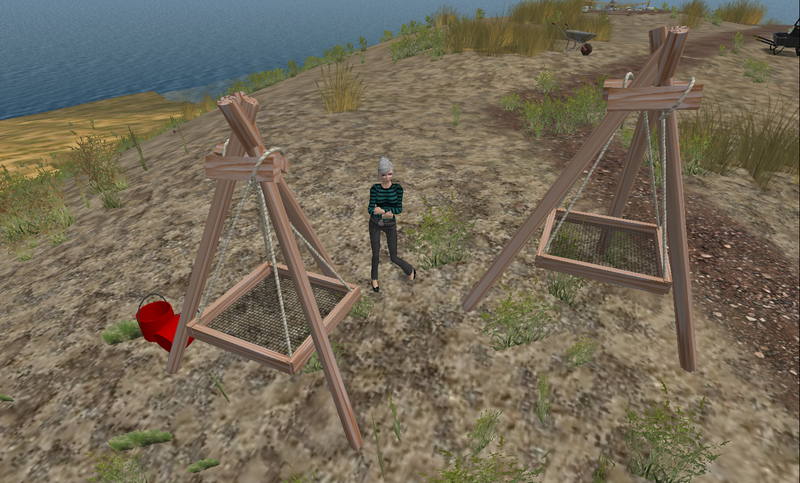 Extemporaneous Machinima Creation, directed by Ruth Tringham. Dress up in Neolithic clothes and flintknap, dance, and join a feast! Film Festival – Showing of movies and machinima associated with the island. Chat and dance next to the fire with the creators of Okapi Island. So on Monday I told one of my bootcamp instructors how we can tell archaeologically when people moved from squatting most of the time to sitting down on things from the bone remodeling in our legs. This was after we did about a thousand squats, so I was wondering if it was more than just my bones aching. Anyway, she seemed rather nonplussed by it–people sometimes don’t react well to my absolutely nerdy and abstruse non sequiturs, but today she came back with a bunch of questions for me, many of which I couldn’t really answer because I’m not a bioarchaeologist. I’ll get back to her…or suffer the consequences in the form of another thousand squats, I’m afraid. Can’t promise that I’ll answer everything, but I’ll do my best! Now if I could only get outreach credit for it…! The best (and worst) advice I received when I got into grad school was “never read all of anything.” This is true for the most part; it is enough to skim most academic writing—the utility being that you know that it exists and can look at it in depth at a later point if necessary. We’re taught “structured reading,” which is basically reading the introductory paragraph, the first sentence of each following paragraph, and the conclusion. This causes no small amount of angst among grad students, as many of us by virtue of having landed in grad school, read ALL of everything, all of the time, and being told that this most beloved of skills is a actually a detriment can be a bit shocking. Very quickly though we learn that structured reading is a survival skill—there is just too much published to keep afloat. This is exacerbated if your dissertation focuses on anything even mildly interdisciplinary—I found myself trying to come to grips with the literature from New Media, Visual Studies, Structuralism, and Actor-Network Theory all within the space of a semester (Spring 2008! I’m so happy you are behind me!) and I still don’t think my brain has entirely recovered. There were occasional weak cries from deep within, “but I’m an archaeologist!” that were very quickly squelched. These cries have recently reappeared while teaching students Final Cut Pro and hodge-podge film theory, but never mind. Structured reading has also changed the way I write for academic audiences, or at least how I try to write—with a strong introductory paragraph, clear opening sentences, and a concise, concluding paragraph. Y’know, like they taught us in grade school. None of the meandering, obfuscatory nonsense that people use to make themselves sound important through fiat of literary flourish. Well, okay, so not much at least. Indeed, most things you can safely breeze through, but there are some texts that you absolutely cannot skim, and actually have to revisit over and over again. I’ve poured over Bruno Latour’s Reassembling the Social and We Have Never Been Modern at least three times now, and I still have to go back and read it from time to time. I’m in the middle of re-reading Tim Ingold’s The Perception of the Environment for dissertation writing and trying to take in every word. I keep Sontag/Barthes/Berger close, and Sara Pink and Gillian Rose are never too far off either. Before I start listing every book on my bookshelf though, grad school has changed the way I read other books as well. I don’t read a lot of fiction anymore and I am a tyrannical snob about the books I read for leisure. I read the New Yorker on the bus for fun, but have no remorse about quitting in the middle of a short story that I am not enjoying. I can generally tell by the shape of a poem whether or not to bother with it. I wonder if poets learn poem morphology—probably too practical, honestly. So, all of this was a long prelude to what I really wanted to talk about–Tim Ingold and perception–but I’ll save it for a later blog post. This is already tl;dr anyway. Did you skim the post or was I chatty enough to hold your attention for a moment or two? Our Spring open house will be on May 4th, and it should be really fun! Watch this space! It’s the second talk I’ve blogged in a week, but Spring is busy with talks, so give me a break! Carolyn White came to present on her project at Burning Man, the large annual festival in Black Rock desert, Nevada that has become a huge cultural phenomenon. I went in 2007, and mentioned it briefly here and here. Carolyn White has been conducting a project out there since 2008 and discussed some of her initial impressions in front of a packed room here at the Archaeological Research Facility. It was great to see so many “outside” people at an archaeology talk, but a little disheartening to see so few archaeology graduate students attending. Carolyn made some interesting parallels with Lewis Binford’s ethnoarchaeology among the Nunamiut and with Jim Deetz’s historical archaeology, but I wish she would have gone into a bit more depth regarding spacial analysis, especially the structuration of space within the Burning Man camp. When I was there I felt very confined–almost crushed by the weight of so many people who had absolutely no idea of how to interact with a desert. She also made several mentions of a landscape “scrubbed clean” of all traces of humans, something that had the soil micromorphologist sitting next to me grumbling about. People leave traces of themselves wherever they go, as minute as they may be. 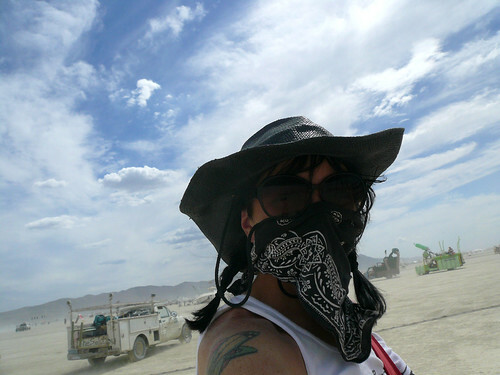 I was also very interested in her transformation of Burning Man into an archaeological subject. She took architectural photos with archaeological scales and artifact-like photographs of the legendary “moop” left behind each year by burners–how did this interaction with Burning Man as an academic subject change the way she saw the festival? So, you can hear the talk yourself on Burning Man Radio. I’m not sure if they have an archive or how exactly it will be broadcast, but it was a really great talk by an archaeologist doing fun, innovative research out in the Black Rock desert. Yesterday I attended one of the department’s 290 lectures, Disentangling Beads: A Contemporary Archaeology of Mardi Gras, presented by Laurie Wilkie and it was a lot of fun. Laurie has been working on her collection for a decade, collecting beads and finding fascinating trends and shifts in what seems like a trivial trinket. She’s observed “bead bleed,” a phenomenon where Mardi Gras-esque beads have begun to sprung up at sporting events, St. Patrick’s Day, and even in Breast Cancer Marathons. The material and originating location of the beads has changed over the years from Czech glass beads, to occupied Japanese and German glass, to Hong Kong plastic, and has undergone a remarkable shifts in size even within the last ten years. 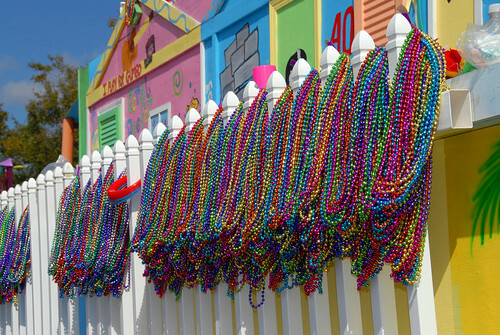 She was able to demonstrate diffusion of these beads from one parade to the next, even between cities in Louisiana, pre and post Hurricane Katrina. Perhaps my favorite part of the talk though was her discussion of how uniquely archaeological her study was, and she gave one of the most cogent “defenses” of contemporary archaeology that I have heard yet–when a socio-cultural anthropology professor in the crowd stated “well, in India they use plastic prayer beads to evoke the goddess and it doesn’t matter that they are plastic….” I wanted to answer her myself! It DOES matter that they are made out of plastic. By foregrounding the materiality of the objects you are able to query practices and cultural interactions in a way that can be invisible through more traditional ethnographic study. Further, she made a fairly incisive remark regarding actor network theory and asymmetrical archaeology being too tidy at times to explain the complications and seeming chaos of the past. All in all, a great talk, and I’m looking forward to her upcoming book on the topic.